Despite the fact that I don’t have a single one on my car, nor have I ever had one on any car I’ve ever owned, I love bumper stickers. I love them on other people’s cars. I love them because I love to imagine the lives of the people I’m sharing the road with, and bumper stickers feed my voyeuristic tendencies beautifully. 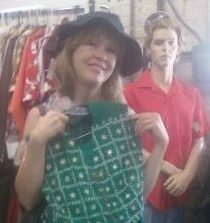 I might get a glimpse into their politics, their favorite teams, their last vacation destination, their religion or lack thereof, their favorite pastimes, what college they attended … you see what I mean? But this one confused me a bit. 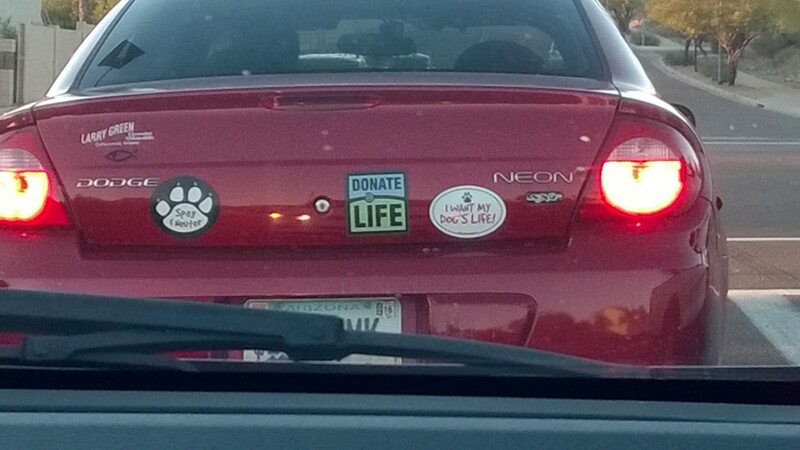 I mean, I realize the guy is an organ donor and a dog lover. That much is obvious. Let’s look closer though. Do you see what I mean? The guy wants his dog’s life. By the way, did you hear of the study done a few years back about bumper stickers? Turns out that people who have bumper stickers — no matter what those stickers say — are more likely to be aggressive drivers than we mild-mannered, sticker-free types. Click here to read about it. I have no idea if the study included neutered males. I’m a no-sticker type person. But I do like to read what is on the car in front of me while I wait a a stop light. Unless, of course, they’ve run the light and I end up first in line. Yeah, there’s some pressure being first in line too. You actually have to pay attention. It’s so annoying! Good point! I can tend to get distracted easily, so focusing is not my forte. Next Next post: Cleanliness is Next to Insanity. Also, a Review of Cat Litter.